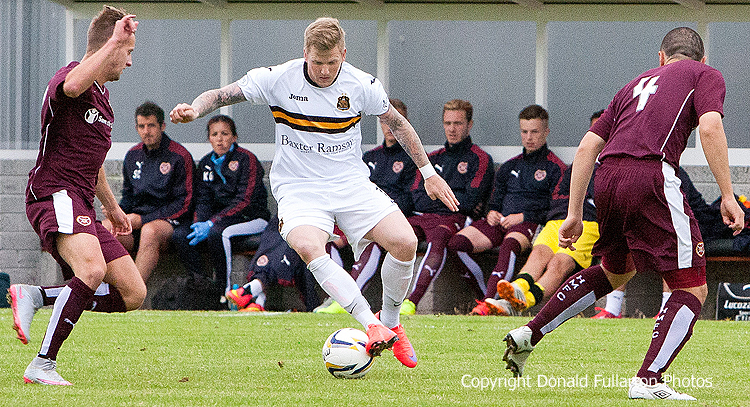 DUMBARTON provided a great start on new manager Stevie Aitken's home debut, beating Hearts 2-0 in a pre-season friendly. DUMBARTON provided a great start on new manager Stevie Aitken's home debut, beating Hearts 2-0 in a pre-season friendly watched by a 370-strong crowd. Having beaten Lowland League champions Edinburgh City 1-0 away in their first game a few days earlier, it was very much a new look squad which lined up against a mostly youthful team from last season's Championship-winning club. Manager Robbie Neilson saw his side well beaten as Sons new signings gelled well and looked a very capable side. Grant Gallagher opened the scoring with a header early in the first half, and Kevin Cawley made it 2-0 midway through the second period — and before Neilson sent on nine subs at once. But still Sons had the upper hand. Winger Willie Gibson, pictured cutting between two defenders, impressed the home fans on his home debut.